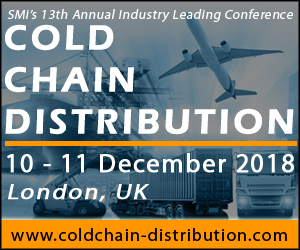 The 13th annual Cold Chain Distribution Conference takes place this December on the 10th and 11th in London, UK. This year’s conference will be exploring new technologies to provide a highly connected temperature-controlled logistics process, whilst remaining GDP compliant. With new regulations and certifications in place such as IATA’s CEIV-Pharma Certification and HSA’s GDP Certification. – Exclusive Panel Discussion: What are the main challenges surrounding the regulatory compliance of Cold Chain and where should pharma companies be looking to invest? For those looking to attend, there is currently a £300 early-bird saving, only valid online. Register today.